This month’s newsletter contains information about the upcoming Sixth IPSI Global Conference (IPSI-6) to be held in January in Siem Reap, Cambodia. We also have a report from events held at the recent CBD meetings in Montreal. We would like to invite anyone interested to provide peer review on the synthesis chapter to be included in the first volume of the “Satoyama Initiative Thematic Review”. Please see the article below for more details and to download the manuscript. Two calls for contributions have been made recently: one for projects looking for funding in the Indo-Burma Biodiversity Hotspot with the GEF-Satoyama Project; and also a call for papers for the second volume of the “Satoyama Initiative Thematic Review” to be published next year. We are also very pleased to share news of the selection of recipients for funding through the SDM 2015 round, and the production of two recent publications. If any members would like to share information about recent developments, please be sure to let us know, and as always, we are looking froward to receiving new or updated case studies from all IPSI members. Please contact us if you have any questions about submitting case studies or other materials. Two of the major events under the Convention on Biological Diversity (CBD) were held earlier this month at the International Civil Aviation Organization building in Montreal, Canada: the Nineteenth Meeting of the Subsidiary Body on Scientific, Technical and Technological Advice (SBSTTA-19) from 2-5 November; and the Ninth Meeting of the Ad Hoc Open-ended Working Group on Article 8(j) and Related Provisions of the Convention on Biological Diversity (WG8J-9). In addition to the dynamic negotiations on topics related to the CBD, two side events were held related to the Satoyama Initiative. The first of these was titled “Collaborative resource mobilization and knowledge facilitation through global partnership: Activities of the International Partnership for the Satoyama Initiative (IPSI)”, and was organized by the IPSI Secretariat at UNU-IAS along with the Ministry of the Environment of Japan (MOEJ) and the Institute for Global Environmental Strategies (IGES). The event featured speakers on IPSI collaborative activities including case study analysis and the upcoming publication of the “Satoyama Initiative Thematic Review”, the Indicators of Resilience in SEPLS, and the Satoyama Development Mechanism (SDM), as well as commentary from experts from MOEJ and UNEP. The second event was titled “GEF-Satoyama Project Forum: Mainstreaming Biodiversity Conservation and Sustainable Management in Priority Socio-ecological Production Landscapes and Seascapes”, and focused on the new GEF-Satoyama Project. Speakers from Conservation International, UNU-IAS, the GEF Secretariat and IGES presented various aspects of the project, and reminded the audience of the ongoing call for contributions in the Indo-Burma biodiversity hotspot (see below). Both events were well attended, and generated a great deal of lively discussion on issues related to the Satoyama Initiative, both among IPSI members present at the meetings and those who were less familiar with these issues. We look forward to taking active part in the next round of CBD meetings, scheduled for April and May 2016. For more information on these events, please see the IPSI website here and here. The IPSI Secretariat invites comments on the manuscript of a synthesis chapter of a publication on “Enhancing knowledge for better management of socio-ecological production landscapes and seascapes” (Satoyama Initiative Thematic Review Vol.1). This publication compiles eleven case studies on the theme, and the synthesis chapter was developed to summarize findings from them. Comments are appreciated on this manuscript from anybody interested in this topic. Please send any feedback to the IPSI Secretariat by Wednesday, 18 November 2015. For more information, including the download link for the manuscript, please see the announcement on the IPSI website here. A new global project was recently announced, called the “GEF-Satoyama Project”, developed by IPSI members Conservation International Japan (CI Japan), the Institute for Global Environmental Strategies (IGES), and the United Nations University Institute for the Advanced Study of Sustainability (UNU-IAS). The project, which has been approved by the Global Environment Facility (GEF), aims to mainstream conservation and sustainable use of biodiversity and ecosystem services, while improving human well-being in production landscapes and seascapes. The GEF-Satoyama Project has opened its Call for Proposals for site-based projects that run up to three years in the Indo-Burma Biodiversity Hotspot. The Call for Proposals is open until 18 November, 2015. The GEF-Satoyama Project will provide a maximum of USD 100,000 to each project. These projects are expected to make larger global impacts through leveraging additional resources, replication and knowledge sharing. The deadline is very soon, but if you think you may still be interested in applying, please see the Call for Proposals website here. In 2013, the Institute for Global Environmental Strategies (IGES), the Ministry of the Environment of Japan (MOEJ), and the United Nations University Institute for the Advanced Study of Sustainability (UNU-IAS) jointly launched the “Satoyama Development Mechanism (SDM)” as a collaborative activity under the framework of IPSI to facilitate further implementation of IPSI activities by providing seed funding to promising project proposals.The SDM Executive Board recently announced the six recipients of grants offered for the 2015 round. 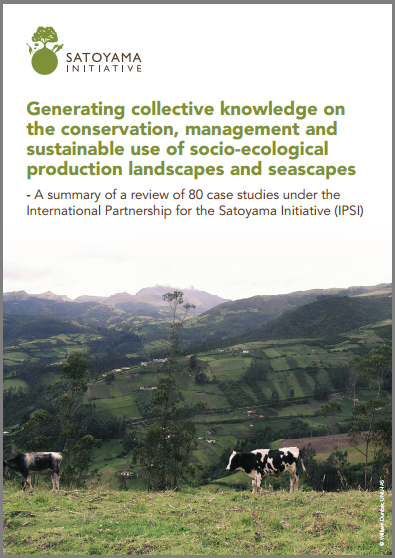 A new brochure on IPSI case studies was recently produced, titled “Generating collective knowledge on the conservation, management and sustainable use of socio-ecological production landscapes and seascapes – A summary of a review of 80 case studies under the International Partnership for the Satoyama Initiative (IPSI)”. The brochure is one of the outputs from a recent project to analyze the case studies that have been collected so far, in order to synthesize the knowledge they contain and extract lessons learned. The brochure contains a great deal of information about the case studies, and it should be a useful resource for anyone working in the field of SEPLS. A full report of the case study review is being developed and will be made available when it is finalized. The brochure is available for download on the IPSI website here. The “Indicators of Resilience in Socio-ecological Production Landscapes and Seascapes” are a set of indicators developed through IPSI collaborative activities including Bioversity International, UNU-IAS, UNDP and IGES. First created in 2011, they were then field-tested and applied in more than 20 countries around the world, and updated based on these experiences in 2014. A Toolkit publication was also published in 2014 to provide practical advice for use of the Indicators in the field. The Indicators have now been published in their updated form in a shorter brochure for wide distribution. The brochure contains basic background information and the set of indicators themselves. Anyone interested in SEPLS, resilience, or indicators approaches is encouraged to have a look at the brochure. The publication is available for download from the IPSI website here.